On the surface, that an institution like Kobberstiksamlingen (the Department of Prints and Drawings at the Danish National Gallery) is showing Artnode´s “100 Drawings” might seem quite innocent. Through the years, Kobberstiksamlingen has been quick to follow new tendencies and projects which fit with its policy, namely the display of art print. And in this particular case it should be pointed out that there is a special connection between Artnode and copper printing technology, which was the first method for mass production of images. Put another way: Presenting images which derive from WWW points to new forms of artistic organisation in computer mediated networks – which implies changes in occuring in art institutions in an era moving away from the “Gutenberg Galaxy” from which copper plate printing derived in the 1400s. However, in the display of this work there is also another intricate connection, because “100 Drawings” is drawn by hand from electronic images on www.artnode.dk. The “original”, i.e. the displayed work, is a hand-drawn copy of other artists’ work, in the first place incorporated in an IT-based system. 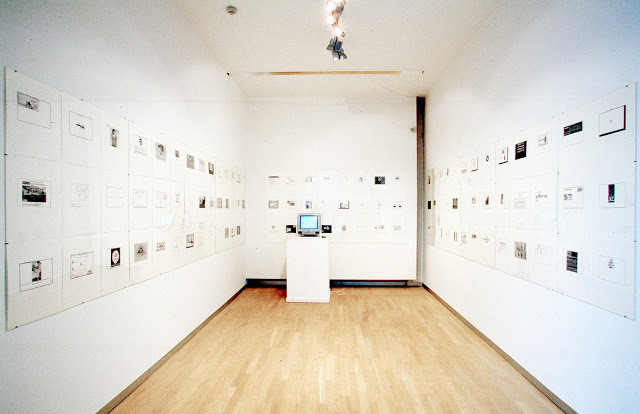 Following a typical, contemporary formula concerning context and work, one may say that an art work has been created which in almost extreme way, but nevertheless quite tangibly, refers to an absent context, the WWW, which in the exhibition appears totally distant and completely superimposed by another context. No codes are activated in Kobberstiksamlingens drawings, and no forms arise on a screen and mayby, it could be added, not much art. Instead what we see is a sort of technological anthropology, to paraphrase Joseph Kosuth – a particular conceptual interest in the exchange between new mass media, like the WWW, and traditional institutions, which stands forward by laying a “hand in” the art work, via references to works that other artists have had their “fingers in”. That the project has this ironic undertone is not because Artnode has intended it consciously. Over a long period , Artnode has worked to put a contemporary artistic perspective on the WWW, and now the group is documenting their work. The irony is directed against the extensive and resilient technology-fobia in classic modernist aesthetic philosophy from Theodor W. Adorno via Martin Heidegger to Maurice Merleau-Ponty and Clement Greenberg right onto the problematics of the “wild painting” of the 80s and a good part of contemporary installation art. One could argue that as a work of art, “100 Drawings” takes technology’s role in Heideggers famous criticism in “The Question Concerning Technology”. Instead of resisting the strategies of technology by concern for the “truth” of being, art is transformed to a technological rendering of being, Gestell, which reveals itself cleverly as a perspective upon the “logic ” of Kobberstiksamlingens collection by displaying hand-drawn copies of electronic mass-representations. “100 Drawings” present a cultural reflexivity with respect to new technology that distances itself from the traditional technology-fobia in art in two ways. First, a particular “trans-aesthetic” is present as the copied images expand like a virulent topology upon the institution’s topography: pure play with random rules, a catastrophe game, as the philosopher Jean Baudrillard writes about the trans-aesthetic in art in the late 80s. But this manifestation of the simulacra’s precession recedes into the background as a kind of necessary “after-form” and instead a reflexive play with art, institution, technology, and media appears. Artnode attempts to draw attention to the intricacy of how new media and information technology already function: One can take “100 Drawings” as a move in a not precisely defined game that appears as a transformation of scale between two discourses, two worlds, two materializations – the mass-mediated information technology’s electronic topology and the topography of the traditional art institution, if one will. The participating artists – those whose works are copied – must accept to be part of the ironic manipulation. They are not taken seriously, one may say, but at the same time, they become part of a larger play which points to the condition of art at the end of the Gutenberg Galaxy. This is what an artist must expect when entering Artnodes web site. “100 Drawings” is a model of the relationship between information technology and traditional art institutions. This modelization finds its material in what is at hand, like any other modelization. The artist Peter Weibel claims that in interactive media art based on virtual reality technology we find the proposition of a new “endo-physical” modelization in a technical system which confronts the habituated “exo-world”, from which we as observers can never distance ourselves because we always observe from a position within the exo-world. Information technology may be conceptualized in accordance with second order cybernetic’s idea of the “observing system”, where the relationship between man and technology places the observer as a dynamic “second-order” component in the system which in this way can be seen from outside, because of the modeling capacity of the technology. Weibel writes, “The media as a whole display man’s attempts, from within his universe to simulate an escape from the universe. Media-worlds are man-made artificial worlds and model-worlds in which man may be internal and external observer at the same time”. Artnode’s display of a number of pencil drawings is, of course, not a virtual reality system. Nevertheless is can be seen as a sort of modelled transformation of scales generated by the group as an exchange between a technical system and a traditional institution. “100 Drawings” is modeling this transformation, not as a Weibelian “endo-world” but as a pragmatic act, a conceptual model in vivo and in situ which we can observe from outside in a conceptual manner, questioning how the world becomes anchored in technological constructions and how technological constructions are anchored in the world – how the phenomenological world, which is still our premise is confronted with a technological perspective.